by piling up plates of glass of the same thickness. These plates of glass can be made originally of a single piece, as nearly uniform in thickness as possible. It has been possible to obtain plates, plane parallel, so accurate that the thickness was the same all over to within one-hundredth of a light wave; that is, less than one five-millionth of an inch. 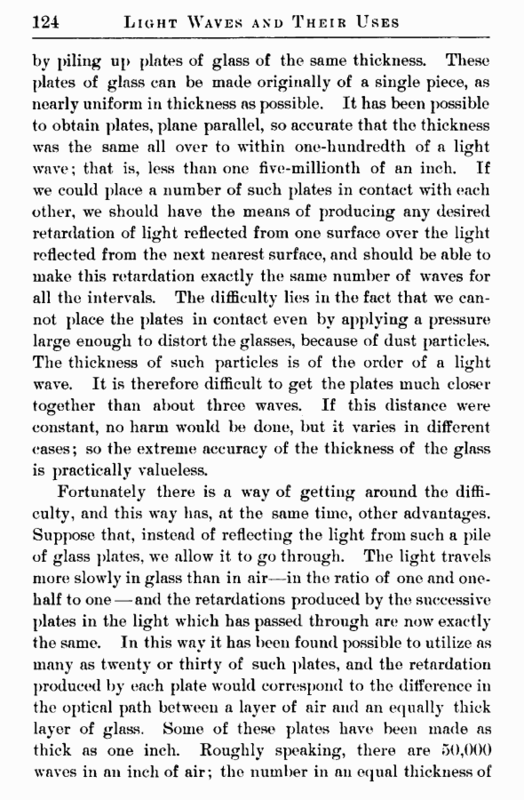 If we could place a number of such plates in contact with each other, we should have the means of producing any desired retardation of light reflected from one surface over the light reflected from the next nearest surface, and should be able to make this retardation exactly the same number of waves for all the intervals. The difficulty lies in the fact that we cannot place the plates in contact even by applying a pressure large enough to distort the glasses, because of dust particles. The thickness of such particles is of the order of a light wave. It is therefore difficult to get the plates much closer together than about three waves. If this distance were constant, no harm would be done, but it varies in different cases; so the extreme accuracy of the thickness of the glass is practically valueless. glass would be one and one-half times as great, so that the difference in path would beJ25,000 waves. But the resolving power is the order of spectrum multiplied by the number of plates. 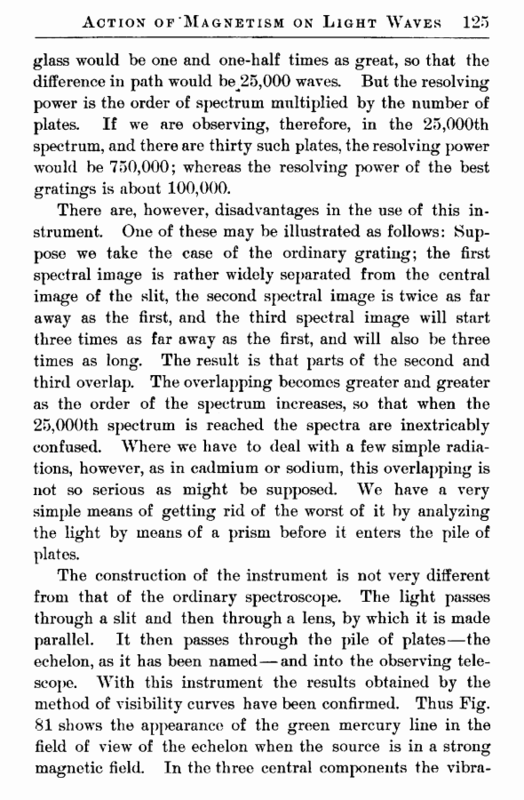 If we are observing, therefore, in the 25,000th spectrum, and there are thirty such plates, the resolving power would be 750,000; whereas the resolving power of the best gratings is about 100,000. There are, however, disadvantages in the use of this instrument. One of these may be illustrated as follows: Suppose we take the case of the ordinary grating; the first spectral image is rather widely separated from the central image of the slit, the second spectral image is twice as far away as the first, and the third spectral image will start three times as far away as the first, and will also be three times as long. The result is that parts of the second and third overlap. The overlapping becomes greater and greater as the order of the spectrum increases, so that when the 25,000th spectrum is reached the spectra are inextricably confused. Where we have to deal with a few simple radiations, however, as in cadmium or sodium, this overlapping is not so serious as might be supposed. We have a very simple means of getting rid of the worst of it by analyzing the light by means of a prism before it enters the pile of plates.